Rarely is such exuberance displayed for one’s art as evinced by Chandrakant Redican’s enthusiasm for spoken word poetry. Chandrakant and his sister Priyam have Indian-Irish parentage and together have started the Bullock Cart Cafe Spoken Word Project. They are part of the Pune Poetry Slam and endeavour to underscore the impact of performance poetry and encourage its permeation to all sections of society. While they have built their base in Pune, writing and performing original poems, organising poetry slams and workshops, they have furthermore extended their reach outside Pune by holding workshops and performances in Goa, Mumbai, Kharagpur, Ahmedabad and Bangalore. They are planning on having the first spoken word festival in the country too. Priyam was a qualified psychologist before she decided to resign from her job as a corporate trainer to write a book and finally devoted herself to performance poetry. Chandrakant is a self-confessed geek with a background in science but eventually he allowed the frustrated artist within him to give vent. He says, ‘Spoken word poetry is poetry that has a very large performance aspect to it. It really opens up audiences and has a much wider reach than page poetry. We established our community in Pune and we perform in the same spaces as stand-up comedy…in pubs as well as more intimate spaces such as book cafés, literature cafés, etc. Chandrakant performs poetry in Marathi besides English and is a full-time lecturer in Food Science and Technology in Pune. In Pune, performance poetry has made an entry into the scholastic environment with performances and workshops in schools and colleges. This is something Chandrakant is looking to recreate in Goa, with the aim of building a community of performance poets here as there is in Mumbai and Pune. Elaborating on the work done in Pune, he says, ‘We have open mikes at Pune with three to four performances per month, and we have about sixty to seventy people coming to perform here. Out of these, the best performers go and perform at pubs and performance venues where more people come’. The community in Pune includes some Goans and one in particular is supportive of the idea of bringing slam poetry to Goa. 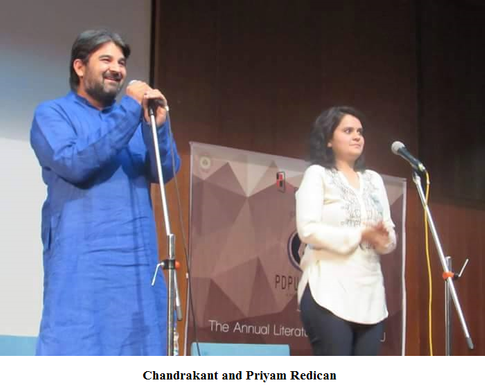 Chandrakant wants to concentrate on around five or six schools and colleges on a regular basis and then, starting with training in performance poetry in English, he hopes to move on to Konkani and Marathi. The Bullock Cart Café has done the same in schools in Arunachal Pradesh, and in other rural and international schools. ‘We think Goa is really important, as in there are a lot of people coming in from outside and there is also a very receptive local population’, says Chandrakant. He hopes to develop enough local talent over a period of about a year or so to sustain the performance poetry scene in Goa. The idea is to balance workshops in government schools and colleges with the same in international schools. A fee will be charged for the workshops, but the amount will depend on the income group. The fees are a means of maintaining the training process, which can be financially taxing. Support from organisations that can spread the word is welcome. The training process has to be consistent and take place in many areas in Goa at the same time to achieve the same results they have had in Pune. Encouraged to write from a young age by their father, it is not surprising that the two siblings took to performance poetry like ducks to water. The Bullock Cart Poetry platform was started with the intention of creating good content. ‘Anything we do, even if it is with kids in a workshop. Therapy and education is a very useful by product, but we want a good poem out of it,’ says Chandrakant. One of their modules is ‘poems on canvas’, where the children paint a picture and write a poem on the canvas itself. The therapeutic effect of the workshops gained through the children expressing themselves is amazing. Chandrakant gives an example of the spoken word being used efficaciously in some of the ghettos in Denver, Colorado. The college drop-out rate is high, but among those young people who joined youth slam groups, there was witnessed an astonishing number who went on to become college graduates. It is this sort of a situation that Chandrakant and his sister are hoping to recreate in Goa. Inspired by the discovery and research of Arachnologist Siddharth Kulkarni on an endemic spider of the Western Ghats, Chandrakant will be performing a piece at 6 Assagao, Goa, on Monday (30th of June 2016) that speaks of protecting this species as well as others. These are some of their videos on YouTube. Please follow the links provided below.